Dragon was designed and developed by Space Exploration Technologies. It became the first commercial spacecraft to dock with the International Space Station on May 25, 2012. 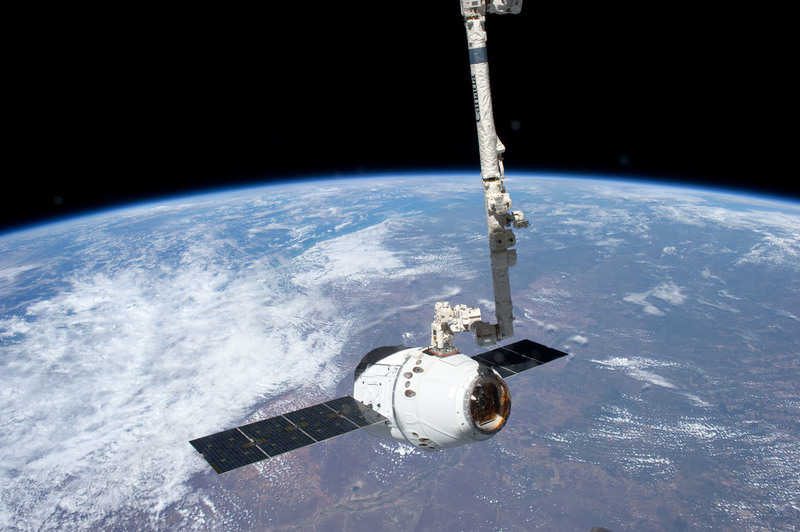 Launched by SpaceX's Falcon 9 rocket, Dragon can send cargo up and bring a large amount of cargo back down to Earth; something the other cargo ships servicing the ISS can't do. This allows for experiments conducted on the station to be returned to earth for study. The spacecraft was developed with help from NASA via Space Act Agreements under the Commercial Orbital Transportation Services program. SpaceX was one of two companies awarded SAAs in 2006. After six years of development, SpaceX was ready to start sending cargo to ISS under the Commercial Resupply Services contract. When Dragon gets to within 10 meters of the outpost, the robotic Canadarm2 reaches out and "grabs" the free-flying craft. The arm the pulls the cargo ship to one of two Common Berthing Mechanism "berthing" ports at the Earth-facing side of the ISS. Once there, the hatches between the orbiting lab and spacecraft can be opened for the crew to unpack supplies and repack it with trash and unneeded equipment for return to Earth. The capsule, which is sometimes referred to as the pressurized section, carries food, experiments and other equipment for the crew inside the International Space Station. Dragon is unique in the fact that it is the only visiting vehicle currently flying that can bring a substantial amount of equipment back to Earth. This gumdrop-shaped spacecraft has a common berthing mechanism at the top for connecting to the ISS. During launch, a nose cone covers this hatch during ascent on the Falcon 9 rocket and is jettisoned a few minutes after lifting off the pad. In addition to the pressure vessel, the capsule also has 12 to 18 Draco thrusters that help maneuver the spacecraft as well as help change its orbital altitude. At the end of the mission, these thrusters are used for the deorbit burn. The Draco thrusters use Nitrogen Tetroxide and Monomethyl-hydrazine as oxidizer and fuel respectively. A total of 1,290 kilograms of propellant is stored onboard tanks inside the capsule's sidewall. 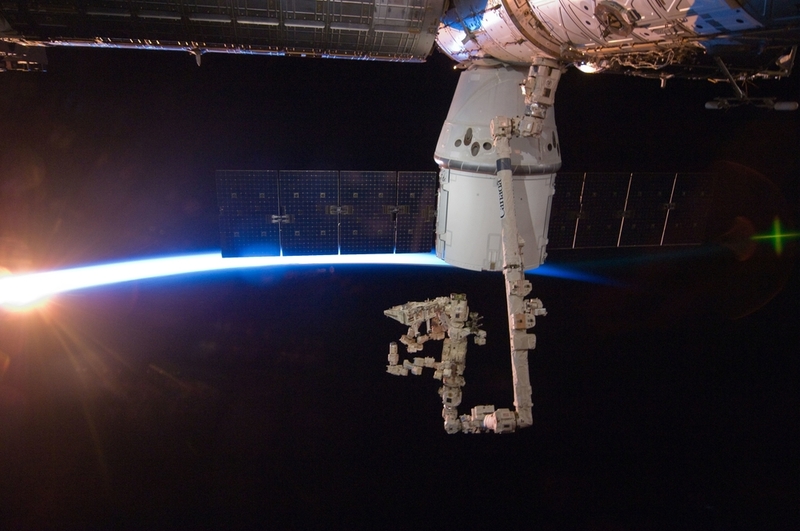 Dragon's reaction control system provides dual-redundancy in all directions, meaning any two Draco thrusters can fail and the mission can continue as planned. Near the bottom-center of the capsule is a sealed compartment that contains essential equipment for guidance, navigation and control. This GNC bay opens up during the mission to reveal a grapple fixture that the space station's robotic arm can grab onto to capture Dragon in mid-flight and berth it to the outpost. Finally, at the bottom of the capsule is a proprietary heat shield. PICA-X is the material the SpaceX uses to protect the spacecraft from the nearly 1,600 degree Celsius temperature of reentry. It was dirived from NASA's phenolic impregnated carbon ablator heat shield. SpaceX's blend is able to be reused multiple times without major degradation. The company claims that no modifications would be required for a reentry from the Moon or Mars. While the capsule is reusable, the trunk of the spacecraft is not. After the deorbit burn, it is detached from the capsule to burn up in the atmosphere. The trunk's most important feature is that of power generation. It sports the dual solar panels on the outside of the structure. These panels are protected during launch by two side-fairings. After being inserted into orbit, they are jettisoned to allow the panels to extend. The second most important feature of the trunk is to transport unpressurized cargo to the International Space Station. This cargo is attached to the upper bulkhead of the structure just below the capsule's heat shield. Many different types of cargo can be sent via the trunks 14 cubic meters of volume. The most notable have been a new docking adapter for the outpost as well as an expandable test module. Whatever cargo the trunk does contain can only be removed by the station's Special Purpose Dexterous Manipulator, more commonly called Dextre. It itself is attached to the station's 17.6-meter long Canadarm2.